Secretary of State John Bolton is to convey to officials on a visit to Israel on Sunday that the United States will be "very supportive" of Israeli strikes against Iranian targets in Syria in the wake of the withdrawal of American troops from the war-ravaged nation. Bolton was due to arrive in Israel for talks with Prime Minister Benjamin Netanyahu and other officials in Jerusalem on Sunday before traveling for talks with Turkey. US President Donald Trump's surprise announcement that it was pulling all of its 2,000 troops from the country sparked concern in Israel over whether Iran would be left with free rein to operate there and whether Russia would respond to its calls to limit it. US National Security Adviser John Bolton on Sunday said that the US will not withdraw all of its 2,000 troops stationed in Syria without a guarantee from the Turkish government that the Kurds will remain safe. The US military withdrawal from the northeastern territory of the war-torn country also depends on the complete eradication of the Islamic State, he said. While speaking to journalist in Jerusalem, Bolton added that President Donald Trump’s administration does not have a specific “timetable” for withdrawal of troops but wants to make clear that their commitment is limited. “The timetable flows from the policy decisions that we need to implement,” Bolton said. A Trump administration official told reporters traveling with Bolton that the Secretary of State intended to discuss with both Israel and Turkey the pace of the pullout. Initially presented as an immediate withdrawal, Trump in recent weeks has spoken about a more cautious schedule (reportedly in part in response to a request by Israel) giving the military four months to complete a safe and orderly withdrawal. Bolton was expected to explain that a contingent of American forces may remain at a key military outpost in al-Tanf in southern Syria to counter growing Iranian activity in the region while others would be shifted to Iraq to continue fighting Islamic State jihadists there. Bolton was also to tell Israeli officials that the US would be “very supportive” of Israeli strikes against Iranian targets in Syria, the official, who spoke on condition of anonymity, said. In April 2017, Trump ordered a targeted missile strike on a Syrian air base after another chemical weapons attack blamed on Damascus. 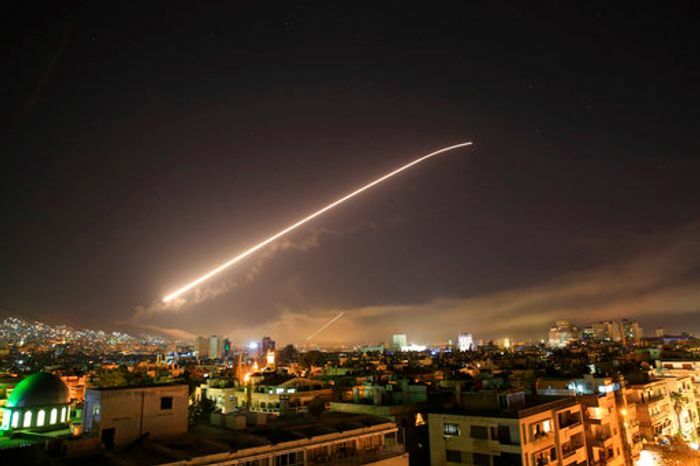 A year later, the US, Britain and France carried out a wave of punitive strikes against Assad's regime in response to another alleged chemical weapons attacks that Trump branded the "crimes of a monster." Assad has denied the use of chemical attacks, blaming rebels in Syria for staging chemical attacks as to provoke a response from the US-led coalition, while Russia said it had proof that the alleged chemical weapons attack in Syria's Eastern Ghouta was staged on orders from London. Russian Foreign Minister Sergei Lavrov claimed that Moscow had "irrefutable" evidence that an alleged chemical weapons attack in Syria was staged with the help of a foreign secret service in April shortly before the US coalition bombed targets near Damascus. "We have irrefutable evidence that this was another staged event, and that the secret services of a certain state that is now at the forefront of a Russophobic campaign was involved in this staged event," he said during a press conference last year.